Property taxes are an important source of revenue for state and local governments to finance government services, particularly education. And despite claims to the contrary, property tax payments continue to provide an outsized share of state and local tax collections. 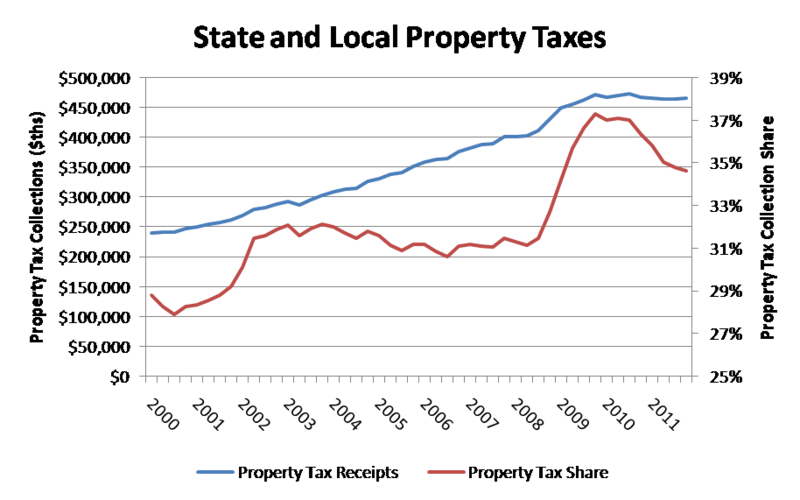 In fact, Census data of state and local government tax collections for the final quarter of 2011 indicate a small increase in property taxes paid on a year-over-year basis. For 2011, approximately $469 billion of such tax was paid by property owners. This total is less than a half a percent smaller than the 2010 total of $468 billion. While there has been some decline in the share of total state and local tax collections due to property tax receipts, the share remains high compared to historic norms. The average share for property taxes since 2000 is 32%, while the current share stands at 34.6%. Consequently, housing and other real estate owners are still paying a higher than average percentage of state and local government tax receipts. This elevated tax burden is significant, especially when one considers the decline in housing prices since 2006 – a decline that has led many to incorrectly conclude that property tax payments have also significantly fallen. According to the Case-Shiller house price index of the 20 largest metropolitan areas, housing prices are down a little more than 33% over the last 5 years. 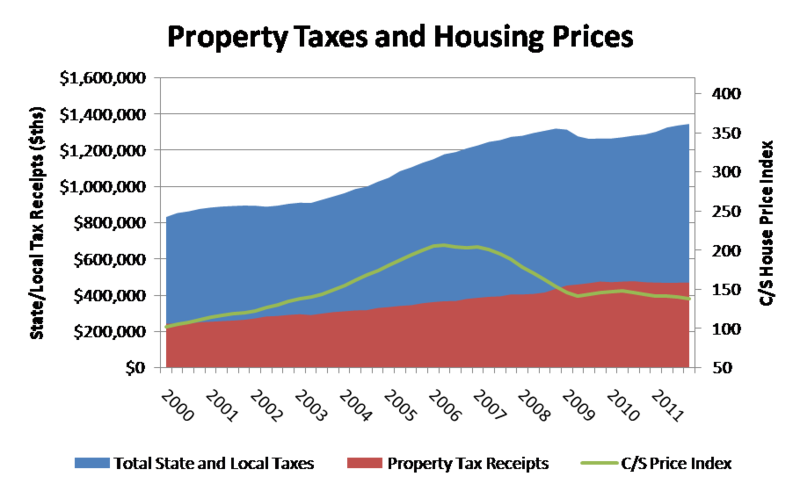 Yet the decline of property taxes paid from the peak is negligible thus far (1.6%). This means that the effective tax homeowners pay on their homes remains high. Nonetheless, as assessments in some areas catch-up to accurately reflect current market values of owner-occupied homes, property taxes are expected to decline – but this has not happened yet. Taxes paid by homeowners and other real estate owners remain the largest single source of taxes for state and local governments. 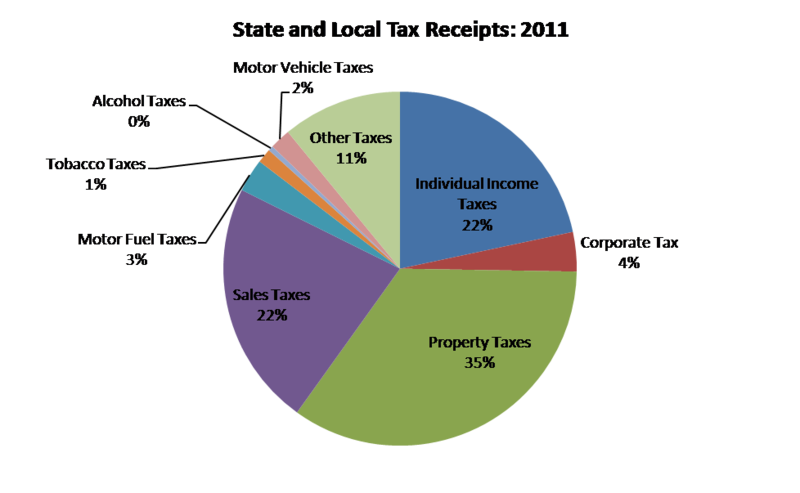 At 35%, property taxes represent a significantly larger share than the next largest sources: sales and gross receipt taxes and individual income taxes, each at 22%. *Data footnote: Census data for property tax collections include taxes paid for all real estate assets (as well as personal property), including owner-occupied homes, rental housing, commercial real estate, and agriculture. However, housing’s share is by far the largest when considering the stock of both owner-occupied and rental housing units.